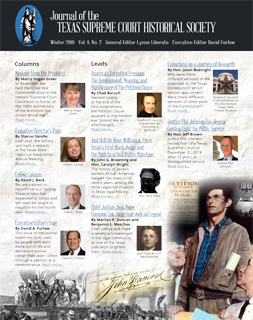 This issue’s theme is “Petition and Remonstrance,” led by a history of the Petition Clause by Chad Baruch and the story of the first African American judge in Texas by John Browning and Chief Justice Carolyn Wright. 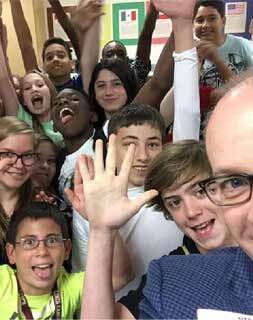 The Society’s Taming Texas program for 7th grade Texas history classes is recruiting volunteers to teach in Houston this spring. For information see the Houston Bar Association site at https://www.hba.org/committees/teach-texas/. 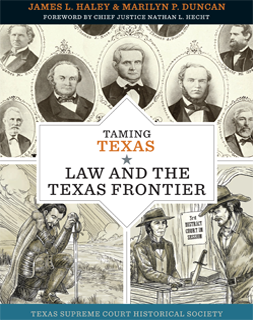 Volume 2 in the Society’s Taming Texas series for seventh graders looks at how laws shaped and were shaped by life on the frontier. The book is available in hard copy and e-versions.